Akrapovič has launched an all-new exhaust system for the ground-breaking Kawasaki Ninja H2R that will further enhance this incredible motorcycle with the latest technologies from the world’s premier exhaust manufacturer. 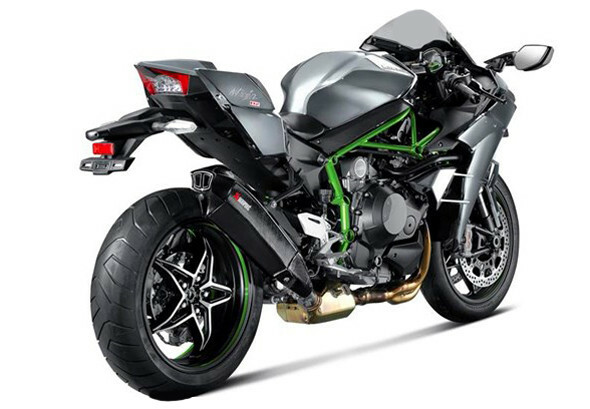 The Evolution Line (Carbon) exhaust system has been developed for the Kawasaki Ninja H2R using the same (r)evolutionary design originally seen on the Akrapovič concept system and first used on the Slip-On Line exhaust for the Ninja H2. 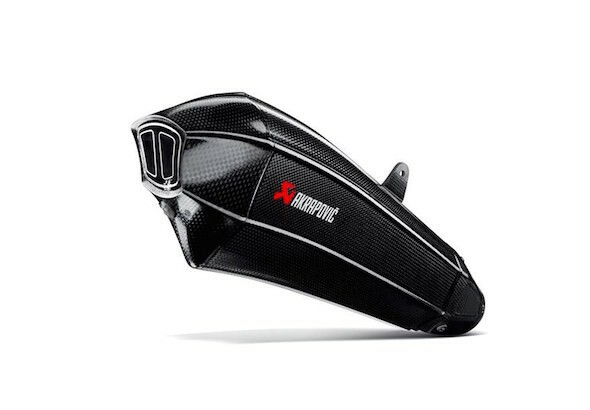 The stunning and unique profile of the exhaust muffler, with the sleeve, end cap, heat-shield, and bracket constructed from beautifully crafted carbon fiber, follows the lines of this motorcycle perfectly and adds to the overall desirability. The system is then further improved with the addition of headers – with parts cast in Akrapovič’s in-house foundry – collectors, link pipes, and a sleeved pre-muffler, all manufactured from high-grade titanium, with each part perfectly designed to get the most from the supercharged engine of this high-performance machine. The Kawasaki Ninja H2R is already considered a motorcycle masterpiece, and the main goal of the Akrapovič technicians has been to lower the noise level to make it compliant for some track usage – the natural home of the Ninja H2R – without any impact on performance levels. Intelligent solutions have reduced the noise emissions from 118 dB to 98 dB without compromising any of the performance that the stock open system gives the Ninja H2R. In fact, due to the finest attention to detail by the Akrapovič R&D department, Akrapovič has actually managed to increase the mid-range power levels to further enhance the performance of the supercharged engine. Akrapovič has taken this superb motorcycle to higher levels of technical excellence, and the improvements to the Ninja H2R, with the fitment of the Evolution Line exhaust system, continue with a striking soundtrack to accompany the bike’s performance. Akrapovič’s sound engineers have tuned the system to give the motorcycle a deeper and richer sound – despite the reduction in noise levels – making the Kawasaki Ninja H2R a more gratifying and enjoyable machine for all to hear and appreciate. The new Evolution Line exhaust system has been constructed with cutting-edge technologies, using premium lightweight materials, all ensuring that this superbly finished and innovative exhaust system is the perfect fit for this stunning supercharged motorcycle and is a joy to behold and hear. It comes with an easy-to-follow mounting manual, making this performance upgrade a simple plug-and-play operation with no need for remapping or other parts, all aimed to make the Kawasaki Ninja H2R a greater machine. The Evolution Line (Carbon) exhaust system is also a perfect fit for the road-going Kawasaki Ninja H2. Designed for track usage, the system will dramatically reduce weight, resulting in improved handling and maneuverability, with increased performance across the entire rev range for both power output and torque levels, all aimed to make the Ninja H2 an even greater track motorcycle. The performance enhancements and weight savings are matched with an improved louder racing sound, perfectly tuned to make the bike sound as good as it performs.